The Balaia Mar Hotel is surrounded by pine trees, eucalyptus and mimosas, set in gardens in the Maria Luisa Beach area, only 400 metres from the ocean. The hotel is 1.5 km from Oura and Olhos d'Agua, and 5 km to the lively centre of Albufeira. The resort.. 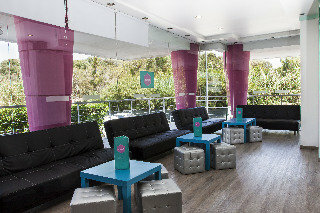 This pleasant beach hotel is wonderfully located in the tourist centre of Albufeira. It is situated just minutes from the city centre and the sandy beach. Numerous pubs, restaurants and shopping venues await guests in the hotel's vicinity. 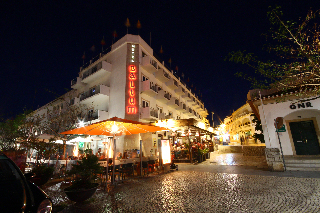 Public transport..
Hotel Baltum is the oldest and most famous hotel in Albufeira. It is located in the heart of this beautiful fishing village, and only 50m from the famous ?Pescadores Beach?. Restaurants, nightlife and shopping is just at their doorstep, making this hotel.. The Barrocal Villas & Apartments rest in the small village of Pera near the lively resort of Armacao de Pera, just a 5 minute bicycle ride to the spectacular Praia Grande beach on the vacation paradise of the Algarve. Featuring a group of 20 villas and..
800 m from the beach and 6 km from the centre of Albufeira. The apartment complex Bayside Salgados is located approximately 800 m from the beach and 6 km from the centre of Albufeira (old town) and 45 km from Faro airport. Complex facilities include restaurant,..